On July 27, 1940, a legendary, world-renowned rabbit was born in Brooklyn, New York. (Actually, he was born in Hollywood, but you’d never know it from the accent.) He’s the wise-cracking, street-smart, self-assured star of the screen, Bugs Bunny. But he didn’t just appear out of nowhere. The bunny that became Bugs was a group effort by a bunch of cartoonists at Warner Brothers studios in the late 1930s. The earliest version of Bugs was drawn by animator Ben “Bugs” Hardaway and was seen in the 1938 black and white cartoon “Porky’s Hare Hunt.” The simply drawn character was a super-hyper combination of Woody Woodpecker and Donald Duck. Friz Freleng, Tex Avery, and Chuck Jones continued to work out the kinks in the still- unnamed character’s persona, and Mel Blanc provided him with his now-legendary Brooklynese delivery. 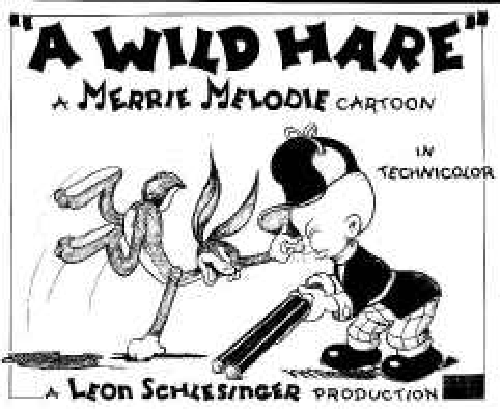 By the time “A Wild Hare” was released on July 27, 1940, they had it down pat (although poor Bugs was still without a name). Producer Leon Schlesinger was immediately sold on the new character and called for more cartoons starring the gregarious and witty rabbit. Bugs got his famous carrot-chewing stance from another famous screen idol of the day – Clark Gable. As Chuck Jones, Fritz Freleng, and Bob Clampett all remembered, the carrot twirling and munching was based on Gable’s character Peter Warne leaning against a fence eating carrots faster than he could swallow them while talking to Claudette Colbert (or Ellie Andrews) in the comedy classic “It Happened One Night”. This scene was so familiar to contemporary audiences that everyone immediately made the connection. Tex Avery added the “What’s up, Doc?” line pretty much as a throw-away phrase; it was simply a common expression in his home state of Texas at the time. But when the short aired, the sight of Bugs nonchalantly chomping on his carrot and inquiring, “What’s up Doc?” was so far removed from the audience’s expectations of what a rabbit would do when confronted by a hunter that it brought the proverbial house down. And so, the gag stayed, and was a part of virtually every Bugs Bunny cartoon thereafter. Bugs Bunny has been one of America’s most consistently popular cartoon characters for 75 years. He has starred in feature-length films, prime-time television specials, and over 175 animated shorts. What makes his appeal so enduring? Unlike many cartoon characters, Bugs Bunny is multi-dimensional. He has a well-developed personality, which makes him more interesting and engaging than other animated characters. He doesn’t back down from confrontation, which was a novel concept in the world of animation until Bugs came along. Maybe it’s too common a fact, but you didn’t mention where Bugs finally got his name. As Chuck Jones relates in quasi-biography, it was simple but still serendipitous: when they were passing around the sketches of the rabbit, Ben “Bugs” Hardaway’s effort had a label of “Bugs’ bunny”. In the same way it could have been “Stan’s bunny” or “Chuck’s bunny”. And no one could really top that alliterative name. The words, “novel” and “until,” cause this sentence not to make sense. The word, “until,” implies that the concept already existed and had recurred (perhaps over the course of several years). If that had been true, however, it could have been “novel” (i.e., new) only once, and the word, “until,” would be inappropriate.